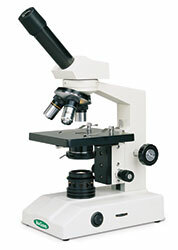 For general use or for labs on a limited budget, VanGuard Basic microscopes are a quality selection. All models feature 10X WideField eyepieces, achromatic objectives, 0.65 N.A. or 1.25 N.A. Abbe condensers, separate coarse & fine focusing controls, stage clips or mechanical stages with drop-down X-Y controls and 20W/6V variable quartz halogen or 20W incandescent illumination. Monocular or binocular heads.